How Do We Get MAX LRVs Now? I took a trip out to the west side this weekend and noticed that this track segment shown in these images is gone. These tracks where used for the first DMU demo, for getting the light rail vehicles onto the west side from what I understand, and generally have been used for storage and such. Now I know, there isn’t much economic use for them, except now I wonder how TriMet will get the LRVs onto the MAX network now? Maybe I’m wrong about this whole situation and they don’t use these tracks, but last I talked to someone about this spur they did. So if they don’t use this spur, what do they use? How do they do this? I really want to know. Speaking of which, this brings me to another topic. What is the shipping policy on these vehicles? After seeing the streetcars arrive by 18-wheeler I was disturbed at the excess cost and ridiculous use of the mode. It wasn’t like a hurricane rescue where… OH WAIT! Norfolk Southern actually ended up delivering THOUSANDS of trailers to the hurricane area after Katrina. So really, what is the excuse to use one of the most polluting, expensive, illogical modes of freight to get the streetcars to Portland? Fortunately the DMUs for WES where delivered here, shocker, by freight rail carrier! The MAX LRVs though, I though, where delivered by freight rail too, but if they’re delivered by heavy weight 18-wheeler I am going to honestly be disgusted. TriMet, Portland Streetcar, City of Portland, Metro, and these entities need to be responsible, and be held responsible by the people when they do things like this. We need a solid, powerful, and active watch dog group to nail these entities when they do dumb things like this. So back to the line in question. Was it really worth tearing up this line? What purpose does tearing it up have? It shouldn’t have taken but a measly half mil to keep in service or something. Now, the line is probably permanently gone. If the area ever need ROW for anything, a road or otherwise, its out of the question. I’m not a fan of decimating ROW like this as it has come back to bite us time and time again. Hopefully there are some answers hiding somewhere out there. A right of way a trail does not make. The track that you photographed WAS NOT used to deliver the LRVs. The track that you photographed and is being ripped up was an access to the General Motors parts warehouse (where Carr Chevrolet is now) that closed about two years ago or so. You’re in the ballpark, though — just west of there is another track that runs north-south from St. Marys (the P&W’s Tillamook District) and crosses Millikan Way just east of the parking lot for the Tualatin Hills Nature Park. That track, which is actually a main track and a siding, is still used today for car storage and switching and P&W, to the best of my knowledge, has no plans to rip up that track. 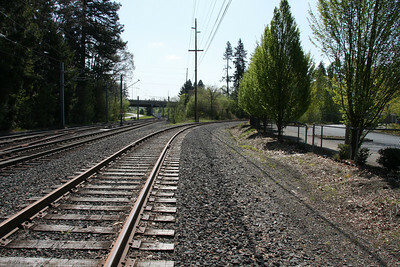 That track then becomes single track again, and curves to the west – connecting with the track as you pictured, and continues west to Beaverton Creek. At THAT point…is a bright orange ramp mounted on the tracks, which is where the LRVs were unloaded. 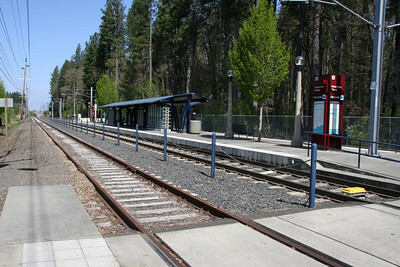 The track continues across the bridge, and then there is a very sharp curve where the former OE track joins the eastbound MAX track just east of the Merlo/158th station. NOW…that all said, I am pretty sure that the P&W crews also removed some track east of the ramp, so in that case the track connection is severed. However it wouldn’t be that difficult to rebuild something that wouldn’t require maintaining the Beaverton Creek trestle. Here’s the kicker – TriMet already was trucking in LRVs from Siemens even while the track was there growing weeds and ready for deliveries. So who is to blame? P&W? Hardly, the track was there. It’s just more short-sightedness from our government. Just like the decision to continue to run a bunch of trucks up and down I-84 with our region’s garbage, instead of loading the garbage into containers, putting them on a shuttle train that would only require one or two locomotives, two or three times a week. (Just like Seattle and Tacoma do.) And Metro even gave barging more consideration, even though barging garbage would require new transfer stations in Portland, more short-haul truck movements in Portland to the transfer stations, and a barge-to-truck transfer station in Arlington (whereas the rail line runs right to the dump). Our buses are delivered by driving them to Portland instead of putting them on a flatbed railroad car. We have a refusal to build serious commuter rail. Portland loves railroads…for all the wrong reasons. When it comes to using railroads for what they are intended – forget it. Yeah. The more I realize how they do things, there is a massive amount of negligence in Portland, almost shockingly so. It is the same track…but it’s not…there’s a lot of railroad history out there. If you go east you can still see where the old spurs used to serve warehouses on the Tek campus; and there is still one BN era whistle/crossing sign between 158th and 170th. I hereby nominate ADRON HALL as the official watchdog for our beloved government entities that continue to do stupid things! I went out there the other day and it appears that the connection to the MAX system MAY still be in place. However, there is an empty roadbed at the Beaverton Creek station. Our shipping of transit vehicles isn’t’ the most efficient.